In this photo provided by the Iranian Students News Agency, ISNA, people look at destroyed buildings after an earthquake at the city of Sarpol-e-Zahab in western Iran, Monday, Nov. 13, 2017. A powerful earthquake shook the Iran-Iraq border late Sunday, killing more than two hundred people and injuring some 2,000 in the mountainous region of Iran alone, state media there said. 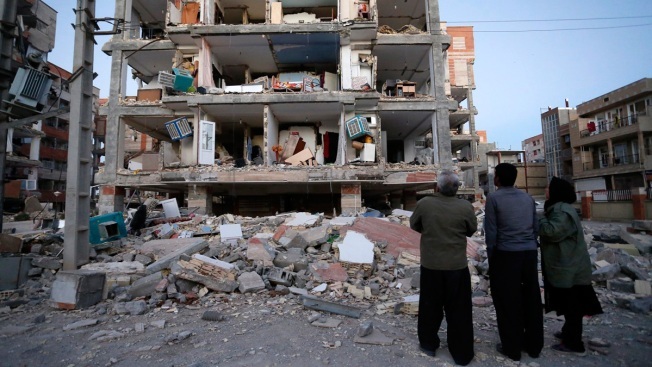 Turkey has dispatched emergency personnel and aid to northern Iraq following Sunday's earthquake on the Iraq-Iran border as officials expressed their "deep sadness" at the tragedy. Prime Minister Binali Yildirim said his country has taken immediate action to provide medical and food aid to northern Iraq. Kerem Kinik, Turkish Red Crescent's vice president, told The Associated Press from Habur border gate that 33 aid trucks were en route to Iraq's city of Sulaimaniyah, carrying 3,000 tents and heaters, 10,000 beds and blankets as well as food. The Turkish military says a cargo plane transporting aid and emergency personnel arrived in Iraq and Turkey's official Anadolu news agency reported multiple dispatches by the country's disaster agency. The foreign ministry said in a statement the Turkish people stand with the Iranian and Iraqi people and is prepared to help Iran if requested. Relations between Iraq's semi-autonomous Kurdish region and Turkey were strained following the Iraqi Kurds' controversial September independence referendum. Meanwhile, Pakistan's government also extended its deepest condolences for the loss of life and injuries suffered by "our Iranian and Iraqi brethren." Foreign Minister Khawaja Muhammad Asif says the Pakistanis' "thoughts and prayers are with the Iranian and Iraqi brothers who lost their lives in this tragic calamity and we pray for the speedy recovery of the injured."